Questa è una piccola anteprima della nuova linea Magnolia Summer Collection "Lazy Summer Days"!!! Ho usato lo sfondo Ocean Background e la Boat Tilda. Adoro questi timbri a tema "nautico";o) Mi dispiace che non si veda l'acetato che ho messo nell'oblò :( Ci ho lavorato tanto! Nella seconda card si vede lo sfondo completo. 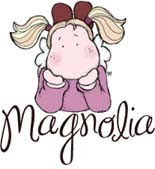 This is just a little preview about new Magnolia Summer Collection "Lazy Summer Days"!!! I'm sorry you can't see the acetate under the round boat window :( I worked a lot to made it! 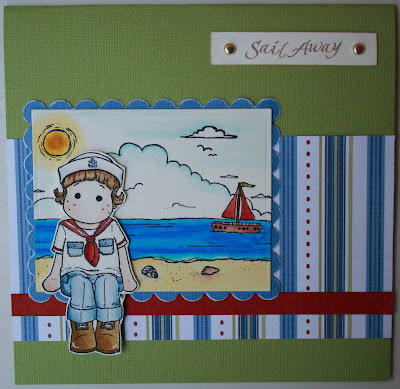 In the second card you can see the complete background. Oh, so nice!!! 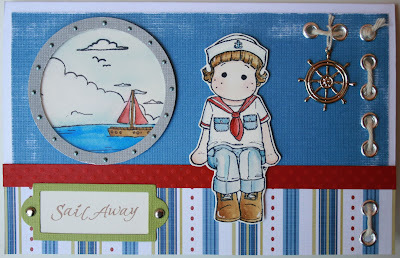 And so many lovely details to look at, you have really caught the sailingfeeling in this card. I can feel the smell of the ocean and hear the sound of the birds! Wow what a brilliant card!